Does not leave any residue or stains. Applying magnesium chloride flakes results in significantly less chloride runoff and pollution than potassium chloride, calcium chloride and sodium chloride. Magnesium flakes are desirable when mixing with other dry products used to manage snow and ice, like rock salt, sand, or other abrasives. Typically, flakes are more cost effective than pellets. Magnesium chloride flakes absorb moisture and creates brine fast which causes quick ice melting and allows for easier ice removal. MAG flakes produce the ice melting speed of calcium chloride ice melt, but without the harsh effects on the environment and surface corrosion. 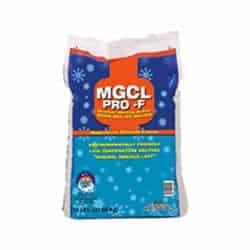 Unlike other ice melt chemicals, magnesium chloride ice melt leaves minimal to no residue which makes clean up ultra easy. 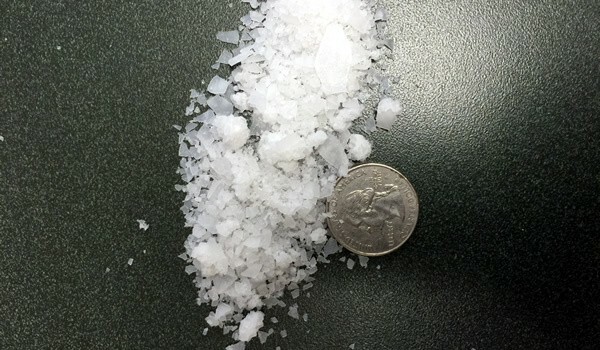 Magnesium chloride flakes are a high performance deicer, effectively melting ice in temperatures as low as -13°F and it works fast – In tests at 21°F, within 15 minutes of application, Magnesium chloride melted twice as much ice as rock salt.